Set of two matching crystal champagne flutes with delicate swirl decoration highlighted with three Swarovski crystals attached to each glass. This superb gift set is supplied in a deluxe presentation box. Bling for your bubbly! These fabulous gift sets contain two matching crystal champagne flutes each featuring delicate swirl decoration on the body highlighted with three Swarovski crystals attached to the flute. This pair of flutes is supplied in a deluxe satin-lined fitted presentation box. 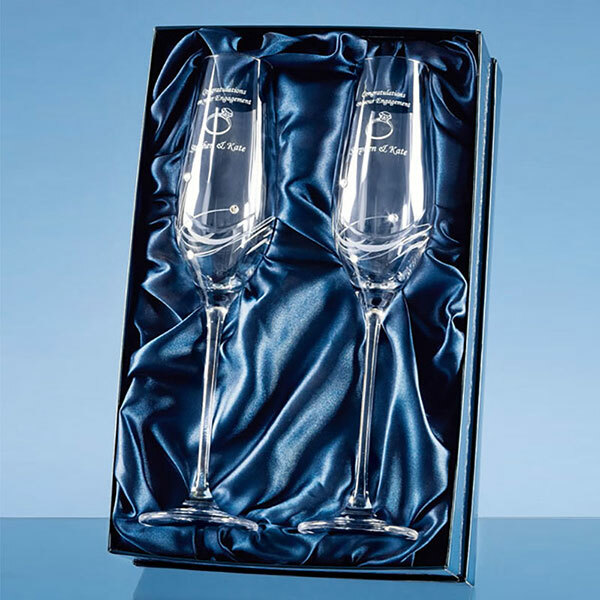 These gift sets can be personalised by laser etched engraving the flutes to create a superb personalised gift or commemorative award item. Text engraving is low-cost for your entire inscription. Logo engraving is free of charge, though a one-off set-up fee applies for new logo graphics. By default, we engrave both flutes with the same message or inscription. If you require different engraving on each flute, please Contact Us first with details of your requirements. Flute height: 265mm. Diameter: 55mm. Weight: 66g.